Dayton is one of the biggest cities in the state of Ohio and plays a big role in the state's economy, boasting some of the most important manufacturing and production companies in the whole of the US. As well as being a key location for business and enterprise, Dayton, Ohio is also a real outdoor city with a lot of great activities to enjoy including cycling, canoeing, and kayaking. With ecotourism on the rise and more people seeking fun new ways to get in touch with nature, kayaking has never been more popular in Dayton and there are plenty of great waterways to explore and enjoy in this Ohio city. 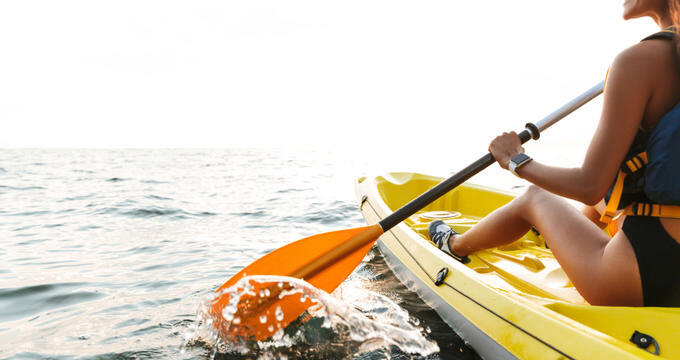 Fortunately, many different kayaking tour and rental opportunities can be found all around Dayton, offering easy and convenient ways to enjoy kayaking in this special city. Various kayaking tours and rental opportunities can be found in and around Dayton. Some companies will simply offer kayak rentals and sales of equipment, while others will offer fully-guided tours on waterways like the Great Miami or Little Miami. Here are a few of the top rated kayaking companies you can find in Dayton, Ohio. As the name suggests, this company focuses on the Great Miami River and offers a range of trips up and down the river at various times of day. Open all year long, Adventures on the Great Miami takes large and small groups along the Great Miami River to see and explore the waterways secrets and best spots. A trained, friendly guide will lead the way, answering any questions you might have, offering pointers to help improve your paddling techniques, and also sharing fascinating tidbits of information about the history of Dayton and the river itself. Various forms of wildlife can be spotted along the way and the relatively calm waters of the river help to ensure that this tour is 100% suitable for everyone, regardless of experience or ability. "Paddle in the Park" events are also offered for true beginners, allowing you to simply float along and appreciate the surrounding scenery. With two locations around the Dayton area, one in West Milton near the Stillwater River and one on the banks of the Great Miami River, Barefoot Canoe offers a varied array of thrilling river tours for both canoes and kayaks. Trips can range in duration from two to four hours and cover lengths of up to nine miles in total. This family owned company provides an authentic and enjoyable kayaking experience in Dayton, Ohio and offers a warm welcome to all kayaking enthusiasts, regardless of age. These great value tours allow you to enjoy two of Dayton's prettiest rivers like never before, and no reservations are required so you can simply turn up at the Barefoot Canoe location on the day and head off for some kayaking fun with friends and family. In terms of tour variety, Rivers Edge Outfitters is one of the best kayaking businesses in all of Dayton. This operator provides three different kayaking tours along the Little Miami River designed to suit all kinds of kayakers. The simplest course, Blue Jacket's Best, runs for just 3.5 miles and is ideal for beginners. Next up, the Kenton's Run kayak tour covers a span of 9 miles and is a great choice for intermediate kayakers or those looking for a little adventure. Finally, the Tecumseh's Trace tour follows a 13 mile stretch of river and can last up to eight hours in total. This company was established way back in 1984 and goes to great lengths to ensure that every kayaker has a lot of fun on every tour.